You’re pulling his quote from way back in thread. Think it has been very clear that you only need to do 1 Difficulty if you don’t want to do all of them. Wouldn’t make sense that lower alliances would never be able to get the Bonus if they are not capable of Epic level. And just in case you were unsure about another aspect, no you don't need to 100% all 5 paths of a difficulty either (there are NO additional rewards for 100%). I got confirmation in game. We tested it and you can complete any difficulty to be considered participating in the 10 for the mission. Personally, i have been doing all difficulties anyways. @Frunzaiute , did yours actually startup, and then later on somehow ended way too early ? Or did the Bounty never even start (even though Alliance pane seems to indicate they did) ? Another person has written that (twice happened) when previous Bounties were over, he opened an Antimatter crystal, but neither time did it actually start a Bounty (someone else then had to start them some minutes later). But he still lost the antimatter he used. 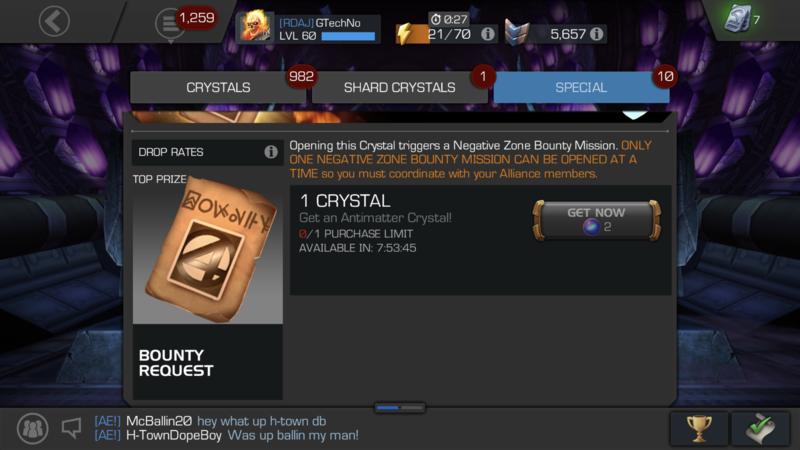 Twice now I have attempted to start a mission when there was not one active, twice the crystal was opened, a prompt to enter the quest popped up, but no quest was available and another alliance mate had to open a crystal. This happened last night and this morning. When I contacted support they refused to even return the antimatter I used for the crystals despite providing screen shot evidence of what occurred. I think the rewards are great and add up, but still really dislike the initiation part of bounties. It’s really hard to consistently trigger bounties, especially if everyone lives in the same area. I think you should get rid of player initiated bounties and just set them on a timer. We are already an hour off the mark because of delays in initiations. That's exactly my thought too. Just have them reset every 8 hours so they stay on schedule. This time the design and rewards of the bounty missions are great. I would suggest just double the rewards and make the event 12 hours and automatically triggered instead of manual. Will be perfect then. 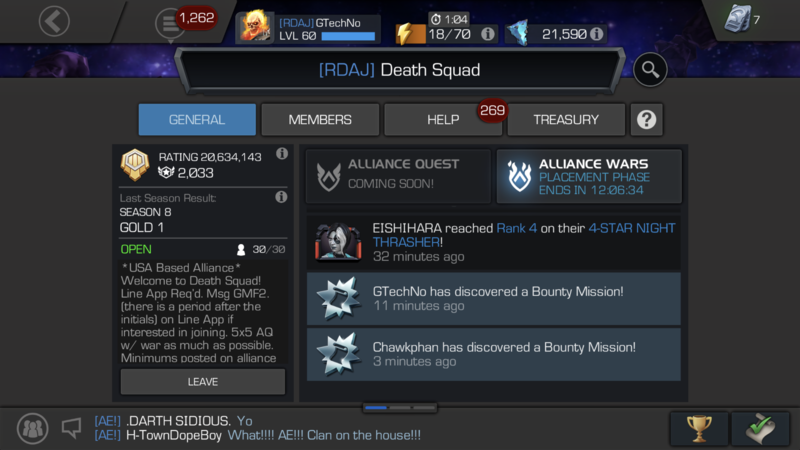 My alliance is having some problems with the missions and kabam dosen't care about it at all. Shame. They dont care about our problems. Is there going to be a fix for starting a bounty mission, and having it close immediately and have to be started again by another person? I have found that it is quite grueling to play these over and over and over again. Plus it is using quest energy so I am finding it more difficulty to complete the standard Event Quest with only 2 weeks left. 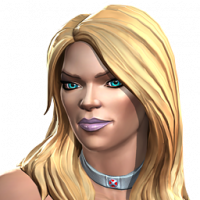 Almost done with Master, one run in Uncollected (Quest 1 and 2) and nothing in Heroic. Serious questing grind this month especially if you are doing all difficulties on the Bounty Missions. Feeling a little burned out. Not doing much arena as well because of it. Game is getting pretty nasty as well. 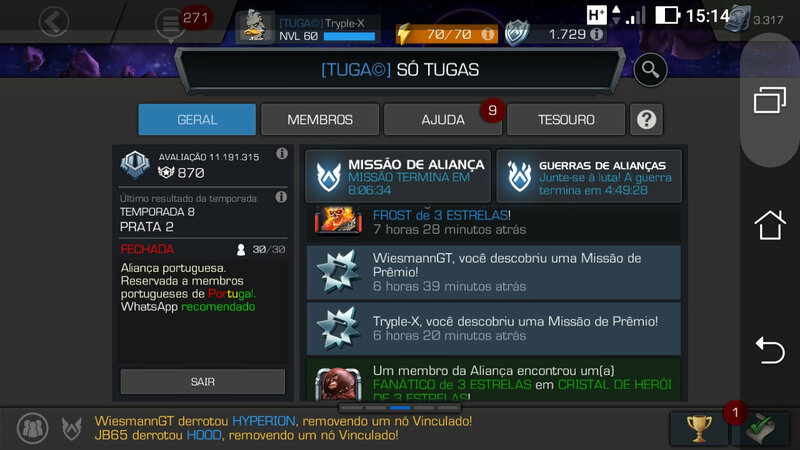 The nodes have made their way to Master now and the new champs are getting harder and harder to beat. How far is too far. 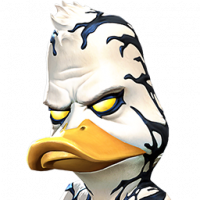 I can compete with the best of them but it is very frustrating to lose a fight in Master because they have Noded up the Thing. The excuse for making the game more challenging is not cutting it any more IMO. Keep in mind that this is coming from someone that has completed every difficulty in every bounty mission up to this point with out revives. It is not that I can't do it, just don't know if I want to anymore. Great way to push people away from your game Kabam. I can already see the decline of what once was a great game.At first, I love the bounty missions because of the T5B shards but now that I have been tackling the EQ as well, I am seeing the potential for a money grab which I have always disapproved of. It is one thing to spend resource on special offers that will get your team better faster but when your content is now designed to try and make people spend just to complete it, that is where I draw the line. Why complete the lower difficulties in the bounty missions? Waste of energy. I do epic and master. Don't see the point in the others although I sometimes do heroic. I've done every Difficulty. Not necessary, but for the effort of pushing the button, it all adds up. Fair enough. It's boring though and the rewards do nothing for me on the lower levels lol. It makes the whole thing feel like more of a grind. I like the top two levels. Helped me get the timing down on the HT specials. This is almost a full quest energy per day. I am used to completing all monthly quest in all difficulties for the credits. With a short month and losing 60 quest energy a day, getting the monthly EQ done has been more of a challenge. Done with master, working on Uncollected. Might be able to get Heroic done but doing anything else will be a stretch. That is more than 200 lost credits of not being able to do medium and beginner. Definitely not enough energy to do any of the class quest for catalyst. I have also used my energy refills on Master so definitely not enough energy for it all. 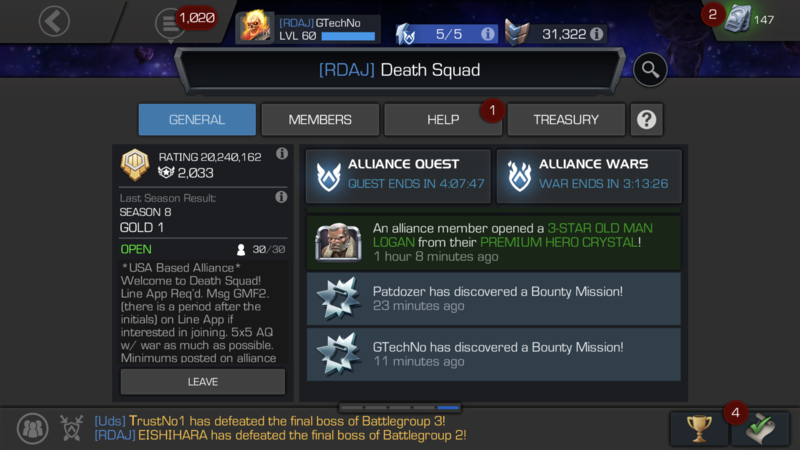 Not sure why Kabam DOES NOT give us credits for Uncollected quest. You would thing that we may need them for this quest in case we need a revive or 2. It is almost like them saying: " If you are playing the difficult quest, you will need to pay if you have not earned enough as we are not going to give you any credits." Kinda a shady move IMO. We have the same issues. I started a bounty mission and I was progressing through the levels then it ended half way through because another bounty mission started and was not able to finish. 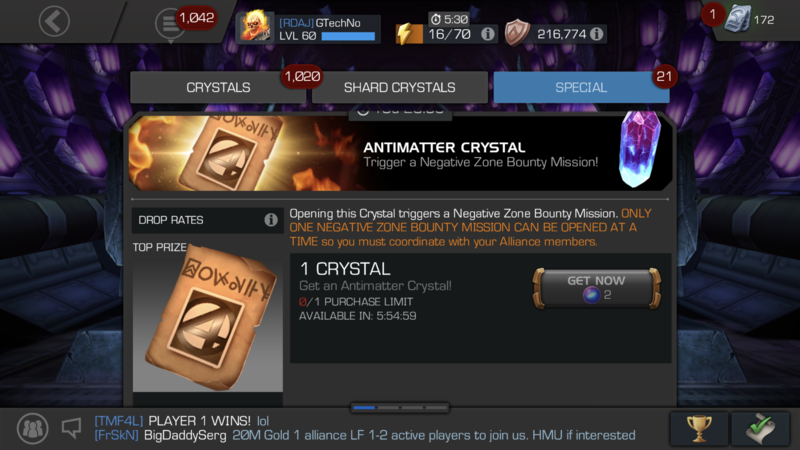 Could it be that these cases of BOUNTY MISSIONS DISAPPEARING are because someone else is opening an Antimatter Crystal AFTER one has already started ?? 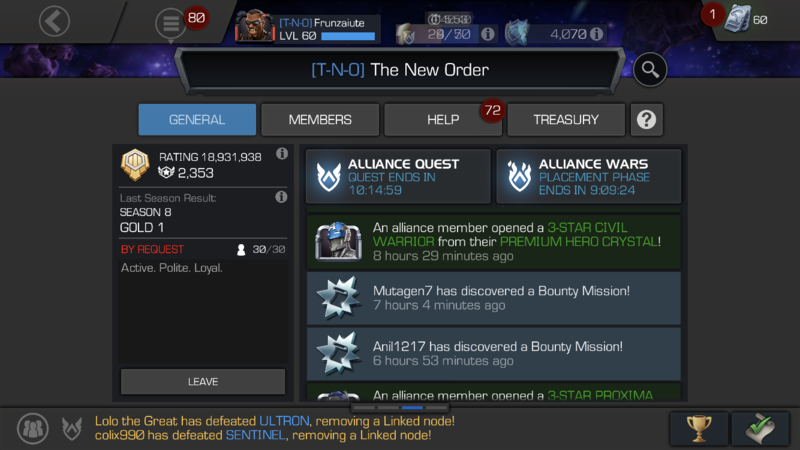 I doubt it happens all the time (and has not happened to my alliance), but might be something to check with those alliances who HAVE had that problem ?? 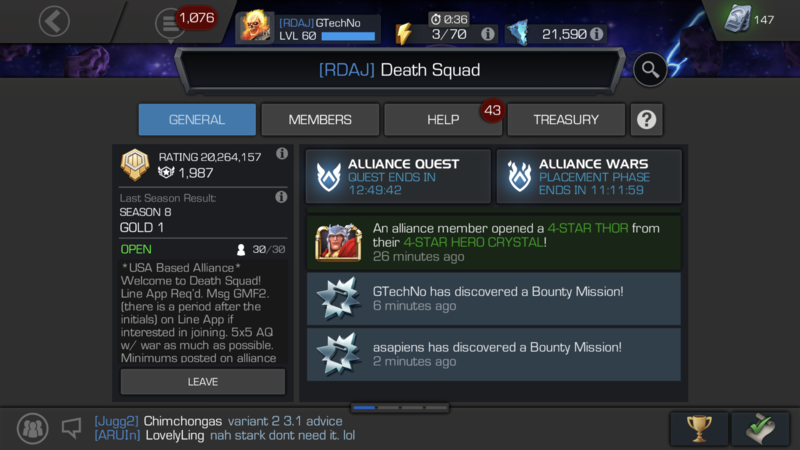 This happens all the time in our alliance therefore we are using double the crystals just to keep bounty missions going. Kabam said you can’t start a bounty mission if you has already started. It also states that under the crystal description. You want compensation for a bug that allows you to run more bounty missions per day than intended? @GTechNo , 1st pic showing a Purchase Limit (of 1) is for the same person. Other people are not prevented from BUYING a crystal. Although not sure what happens if they try to open it (don't think game would prevent someone else from opening even if one is ongoing, thus their message saying COORDINATE). If the game really did prevent anyone else from opening, they wouldn't need that Coordinate wording in there. But as to whether that is causing the early ending (or basically a false-start), not sure anyone's pinned down the cause yet. @DNA3000 , that would be an interesting thing to try (for those alliances having the terminated problem). If they manage to run a Bounty from the initial Starting of it, and get the rewards. And then it terminates early and a new one starts up (say within 30 mins or whatever of original), and now you run a Bounty again, will it give you rewards again ?? Or will it know that you had already completed that difficulty from the early-ended bounty, and NOT give you duplicate rewards again within the SUPPOSED 8 hour window ?? Even though it is acting as if it were a brand new Bounty that had been started. Hmmm. I've actually seen this happen more than once now. 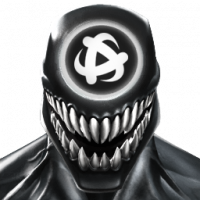 A bounty will "prematurely" complete, and then an alliance member will start another one, and then that new one functions normally. Generally, I see the bounty rewards twice, although it is hard to keep track. But even if you didn't, the more valuable thing is being able to run more than one bounty in an eight hour period, since those rewards are larger. I did try to report a bug with the bounty system early on and support kindly patted me on my little head and explained to me that I was confused. So going out of my way to research and explain to them how I might be getting more shots at the bounty missions than the design intended is not high on my priority list at the moment. What about any leftover antimatter? Can they be used to purchase anything else?